A fantastic half moon Coalbrookdale style cast iron plant stand. Three tiers measuring 115 cm wide 74 cm tall and 57 cm deep. 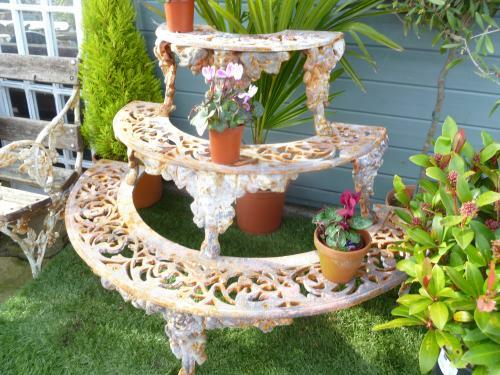 A truly beautifull plant stand to enhance any garden or conservatory. These are made of cast iron so will rust but to me that just adds to the charm and makes them even better looking. This is finished in Antique brick red, a rusty apperance with layers of paint.